This stencil clearly says, “Fire Exit” and will make it easy to guide people to the nearest exit during an emergency. You can also use this to mark a specific door to be used only as an emergency exit so people don’t use it for their normal entrance or exit. 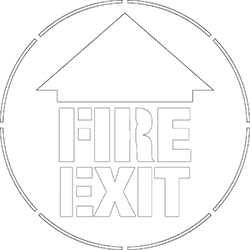 However you decide to use this particular type of stencil you will find that it is very effective at identifying doors or even windows in your facility as able to be used during a fire. This is especially important if you have indoor doorways that don’t lead to an outdoor exit. People need to know which doors can be used to get outside during a fire and which can’t. This stencil makes it fast and easy to paint on this marking so people can see where they are going with just a glance during an emergency situation. When looking to improve safety and visual communications, this stencil is an excellent option.